It is a matter of great pride and honour for all of us at ISSSP-NIAS that the National Institute of Advanced Studies (NIAS) and the US National Academies of Sciences (NAS) publication on Technical Aspects of Civilian Nuclear Materials Security found mention in India’s National Progress Report at the Nuclear Security Summit 2016 held in Washington DC. 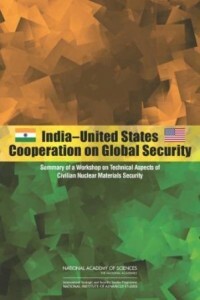 The NIAS-NAS publication is titled India-United States Cooperation on Global Security: Summary of a Workshop on Technical Aspects of Civilian Nuclear Materials Security and was published by the National Academies Press in 2013. The publication was the summary report of the Workshop jointly organised by the National Institute of Advanced Studies (NIAS), Bangalore and the US National Academies of Sciences (NAS), Washington DC at the NIAS campus on October 29-31, 2012.